New for 2019, meet “All In a Day” mascots Ray and Luna. Over the last two years, “All In a Day” — Emory’s annual day of giving — created energy, enthusiasm and some friendly competition between Emory schools, centers and departments, raising more than $1.5 million combined from thousands of gifts. All In a Day returns for its third year with several new features. Kicking off at noon Wednesday, Feb. 6, and running through 6:36 p.m. Thursday, Feb. 7, this year’s event surpasses the 24-hour timeframe of the past two years, expanding by 6.6 hours to last 1,836 minutes in honor of the university’s founding year. For many contributors, All In a Day is personal. Folashade Alao 05G 09G will give to the Kharen Fulton Diversity Graduate Award, named for the Emory administrator who was an inspiration and influence during her doctoral work. Participants can invest in any part of the university. Popular choices are student scholarships, especially at Emory College of Arts and Sciences, where last year donors made nearly 510 gifts totaling $120,000. By supporting the Emory College Fund for Excellence, Dooley Scholarship Endowment, and other funds, donors created an immediate difference for Emory College’s high-achieving students and outstanding faculty. “Emory College of Arts and Sciences is a leader in higher education thanks to gifts that fund key initiatives, including scholarship support, funds for innovation, and travel and research grants, which help transform lives by enabling students and faculty to take advantage of everything that Emory has to offer,” says Emory College Dean Michael A. Elliott. By enlisting Emory influencers to recruit donors to match challenges and unlock bonuses on the allin.emory.edu website, scores of volunteers and ambassadors utilize social media channels to amplify the messaging in an effort to increase giving from every individual — regardless of region, generation, school or unit — who has been positively affected by Emory. Sydney Cohen 20C, co-president of the Student Alumni Board, will serve as an All In a Day ambassador. She will rally her peers and reach out to the alumni in her network. Alao believes All In a Day is about engaging with Emory. “We want alumni, friends and donors to deepen their relationship with the university, to think of ways they can do more — whether mentoring a student or participating in an event. Engaged relationships are the key to Emory’s long-term success,” she says. Alao, Cohen and 500 volunteer ambassadors will help get the #allinemory word out and drive competition. They make a difference: Last year, ambassador outreach accounted for about 40 percent of All In a Day gifts. 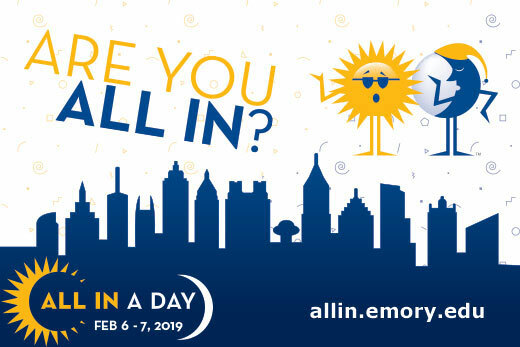 To volunteer as ambassador or give during All In a Day, visit allin.emory.edu.